Where are U.S.-Korea relations going? The Korea Society is a key player in two ongoing studies on U.S.-Korea relations, Yonhap News reports (S. Korea, U.S. specialists launch study on bilateral ties, Dec 22, 2007). WASHINGTON, Nov. 9 /PRNewswire-USNewswire/ -- Representative Diane Watson of California, co-chair of the Congressional Caucus on Korea and a member of the House Committee on Foreign Affairs Subcommittee on Asia, the Pacific and Global Environment, along with nine of her colleagues in the U.S. House of Representatives, sent a letter to the House leadership noting that the "geopolitical context" of the U.S.-Korea Free Trade Agreement (FTA) deserves consideration as Congress continues deliberation about the agreement. 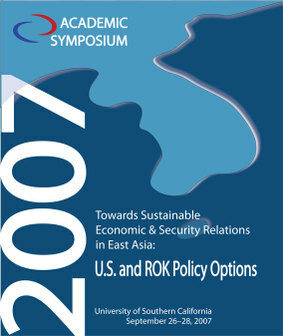 If you were like me, and missed the live Webcast of the symposium "Towards Sustainable Economic and Security Relations in East Asia: U.S. and ROK Policy Options" last week, drop a line to USC's Korean Studies Institute which co-sponsored it - they'll send you a free DVD of the Webcast (send an email to Julia Cunico at "jbc_at_keia.org"). The day and a half symposium, which was also co-sponsored by the Korean Economic Institute, had at least a couple sessions that bear on the FTA. Here is the program. On Thursday the first panel discussion - U.S.-Korea economic relations - included a presentation by Robert Stern and Kozo Kiyota of the University of Michigan. Stern and Kiyota used the distinctive Michigan Computable General Equilibrium Model to evaluate an FTA between the U.S. and Korea (Economic Effects of a Korea - U.S. Free Trade Agreement). The panel also included a presentation by Jongryn Mo, Professor of Political Economy at Yonsei University in Seoul. Jeffrey Nugent of the USC Economics Department served as discussant. The first session on Friday, "East Asia's Economic and Security Regionalism: Old Constraints and New Prospects" may also be useful. The three presenters here were Gilbert Rozman, a sociologist from Princeton, whose whose work explores "national identities, especially in Japan and South Korea, to understand how they shape bilateral trust and evolving relations in the region," and co-presenters and co-authors, political scientists Min Gyo Koo of USC and Vinod K. Aggarwal of Berkely. They've been working together on Northeast Asia regional issues for several years. Most recently, they're joint editors of a new book, Asia's New Institutional Architecture: Evolving Structures for Managing Trade, Financial, and Security Relations , which will be published this November by Springer. Other panels appear to be less directly connected to the FTA: (1) U.S. - ROK Security Relations, (2) Can a Deal Be Done? The DPRK Nuclear Question, (3) Korean Soft Power: Transnational Cultural Flows, Korean Film, and Diplomacy in East Asia. Because the U.S. has important political/diplomatic objectives for the agreement, these sessions may still be relevant. Korea and Japan have an unresolved territorial dispute over what the Koreans call the Dokdo Islands (the Japanese call them the Takesima Islands). The two small islands, surrounded by rocks and reefs, lie in the waters between the two countries. Here's another useful source: Dokdo Island. Min Gyo Koo discusses the dispute in the Harvard Asia Quarterly: Economic Dependence and the Dokdo/Takeshima Dispute Between South Korea and Japan (Fall, 2005). Does the FTA have implications for Korea's territorial claims: KORUS FTA Threatens Dokdo! (The Marmot's Hole, July 5).